FBW's logo design contest was not a success without the commenters who shared their ideas on why they voted for the logo of their choice. On the commenter's part it was a tough decision that needs justification. 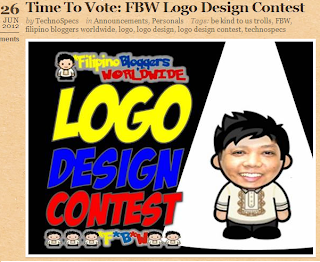 And because of that, judging the best comment for Filipino Bloggers Worldwide's logo design contest was not easy, but in every contest there is a winner. Logo entry number 9 gets my vote! The logo may look simple but it is the most illustrative and meaningful compared to all the other entries.It is intricate yet straight-forward enough to define exactly what the Filipino Bloggers Worldwide (FBW) site is all about: A virtually-connected world where all Filipino bloggers all over the globe can unite as one. 1. The logo's intended meaning can be easily discerned and appreciated by most individuals. "Filipino" is represented by the salakot, "Bloggers" by the wi-fi or network connectivity symbol, and "Worldwide" by the globe. 2. Our focus is not severely disoriented by several fancy colors and other distracting images found on the other logo entries. A good logo does not need to clutter itself with too many decorative highlights, but needs to enforce more significance. 3. Filipinos can easily identify with the logo since the "salakot" has been one of the most common symbols of Filipino identity. The "salakot" is the traditional wide-brimmed headgear of the Filipino. It is often portrayed as the hat worn by Juan de la Cruz, the symbol of the collective Filipino psyche equivalent to Uncle Sam of the Americans. 4. The logo contains a globe with grid lines. A grid is a network of uniformly spaced horizontal and perpendicular lines specifically used for locating points (as on a map, chart or aerial photograph) by means of a system of coordinates.In other words, we are speaking about an intelligent geometric pattern into which, theoretically, the Earth and its energies are organized. That is what we want the site to achieve: to be able to easily find each other and combine our "energies" for the good of all. 5. The logo implies that we are all connected. Whether wired, as illustrated by the elegant script style font (synonymous to network cables) of the FBW lettering, or via wireless as illustrated by the wi-fi signal symbol under the "salakot." Regardless of how we are connected, it signifies the almost non-stop and continuous connectivity our site wants to achieve. 6. The logo is "catchy" enough to attract attention, and meaningful enough to be remembered. You could even easily sketch or describe it for others to easily comprehend. There are so many logos out there but the most successful in the "recall factor" are those that are simple yet depict a deeper meaning. If I were to create a logo for anybody, I would craft it out from the most vital pieces of information that would best define our goals, intentions and commitment. Without a doubt, the logo has all the factors necessary to clearly send its message across. Mabuhay to logo entry number 9! wow! thanks a lot! yippeee! I am deeply honored...first time to join a bloggers group and first time to join a comment contest...and I won!